If the recent frost and hard freeze had you scampering to clear the last of the tomatoes from the garden, I have got you covered with a recipe for some excellent sauce to make with those babies. This Home-Canned Pasta Sauce has been a favorite with us for several years, and everyone loves it. Basil and garlic enhance the tomatoes for a most delectable gravy. And after all the chopping, simmering, jarring and processing is done, how about some meatballs? Usually, when I reach into the freezer with meatballs on my mind, I grab a package of ground beef, but the other day, I felt like something a little different and chose ground turkey. 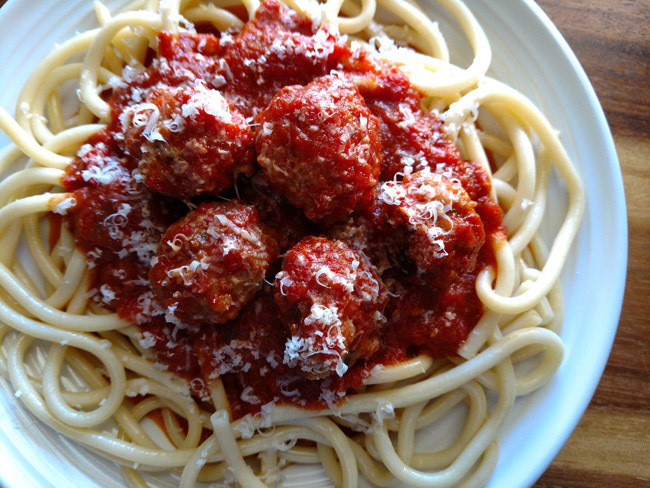 The resulting meatballs were tender, flavorful and, best of all, super simple to prepare. Nestled in a bed of pasta and blanketed with some of that fresh sauce (or purchased sauce, I don’t judge), these are a perfect lighter option for a cozy comfort food meal for the now cooler evenings. Turn the last of summer's tomatoes into a light and delicious pasta sauce. Preheat oven to 400 degrees F. Line a sheet pan with foil and coat with cooking spray.